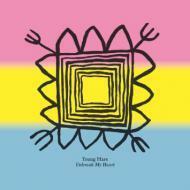 Young Hare is Marc Krause and Martin Pfanzer from Frankfurt am Main. They play as a so-called 2-piece, named after the Wikipedia featured article of the day. In three-year history of the band, they have tried out a huge amount. The instrumentation changed, new recording techniques developed, and an unconventional live set evolved. Their first four track demo tape “Pick a fruit” was sold out so fast that they forgot to keep one for themselves. Shortly thereafter followed 12” and a split 12” with the band Bdybldng from Berlin. Young Hare recorded their album between May and October 2013. “Unbreak My Heart” sounds like a studio record which wasn't produced in the studio. Young Hare - Pond Life from Altin Village & Mine Records on Vimeo.